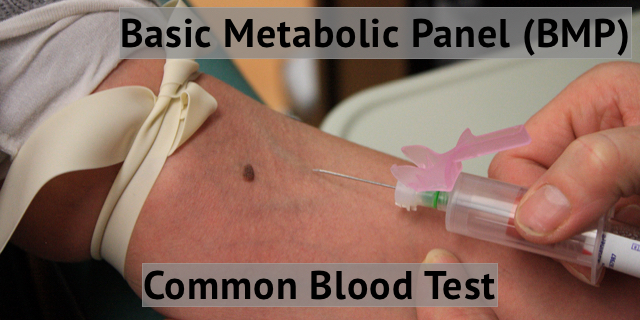 A Basic Metabolic Panel is one of the most common tests that your provider can order. It is used to learn about your kidney function as well as calcium levels and glucose levels. You need to fast 8 to 12 hours before this test. What’s measured in a Basic Metabolic Panel (BMP)? Creatinine: Creatinine is a waste product that is filtered out of your blood by your kidneys. If you have a high creatinine level in your blood it is a sign that something is wrong with your kidneys. Blood Urea Nitrogen (BUN): Urea is another waste product that is filtered by the kidneys from your blood. It you have a high level of urea in your blood, you may have kidney damage. Urea is a waste product of the break down of amino acids in the liver. Low levels of urea can mean that there is something wrong with your liver. Electrolytes: Minerals that you consume are used in the body to maintain the right balance of fluids and chemicals in your body. Calcium: Calcium is an essential mineral needed by neurons to send signals throughout the body. It is important for maintaining bones and teeth as well as helping with muscle contraction and heart function. Glucose: Glucose is the sugar in your body that is used for energy. Abnormal levels can mean problems with your pancreas. Here is an infographic based on information from Cleveland Clinic. Informative. Data which show creatine, BUN and na mg and k normal and abnormal .very useful.